Almost always involves a number of people. Enjoying good food in the company of friends should be a cause of happiness, a celebration A Thai meal is composed of a variety of dishes, with rice as the centrepiece. It should include a combination of these flavours, sweet, sour, salty and hot, but in typically Thai manner there are no rigid rules about what goes with what. It is usual for all the dishes to be served at the same time, as unlike the style in the West, a meal is not made up of many separate course. The management and kitchen staff are Thai and we take pride in presenting you authentic Thai food from the "Land of Smiles" We hope you enjoy our cooking, as all food is freshly prepared to our best standards. Welcome to Bahn Thai Restaurant. We thank you for trying our restaurant and we sincerely hope your meal will be a memorable experience. The national soup of Thailand. 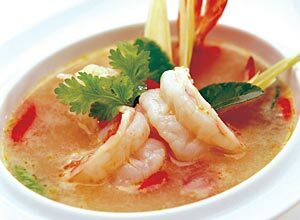 Tiger shrimps with lemon grass, mushroom, lime leaf, and fresh lime juice.